The “Notice of free inspection for customers using the Dive Door “AKA-DDX1 with the Waterproof Case “SPK-X1” for 4K Action Cam” regarding a free inspection service was announced in July 31, 2015. Sony will offer an extension of the free inspection service until October 31, 2017. 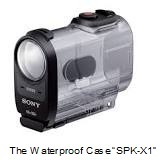 It has come to our attention that the REC button of the Digital 4K Video Camera Recorder Action Cam “FDR-X1000V” or “FDR-X1000VR” may sometimes not work when the Waterproof Case “SPK-X1” supplied is used with the Dive Door “AKA-DDX1 ” which is sold separately for underwater shooting to a depth of up to 60 meters. We kindly request that customers using the Dive Door “AKA-DDX1” with the Waterproof Case “SPK-X1” to contact Sony nearest service centres to request a free inspection. Please be advised to bring along the Dive Door “AKA-DDX1” and the Waterproof Case “SPK-X1” for inspection. ・The REC button does not work. ・The waterproof performance degrades due to forceful pressing of the REC button. *You can protect the Action Cam up to 10m deep with supplied or separately sold Waterproof Case (SPK-X1) for waterside fun like surfing.